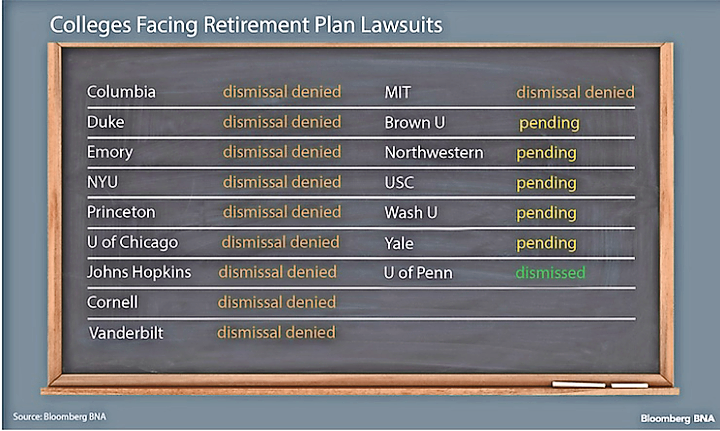 A lawsuit challenging how the University of Chicago runs its two large retirement plans got a boost when a federal judge reinstated claims involving a $2.1 billion plan covering about 13,000 university employees and former employees. The university worker who challenged the school’s $2.1 billion plan sufficiently alleged that he paid excessive record-keeping and administrative fees, a federal judge ruled Jan. 10. In September, the school convinced the judge to dismiss all claims related to this plan—leaving in place only challenges to the school’s smaller $980 million plan—by arguing that none of the workers involved in the lawsuit received benefits through the bigger plan. The workers resolved that issue by adding a new party to the lawsuit, the judge said, and he allowed challenges to both plans to move forward. The University of Chicago is one of more than a dozen prominent colleges to be hit with proposed class actions challenging their retirement plans in recent years. So far, the University of Pennsylvania is the only school to defeat one of these cases outright, with judges allowing similar challenges to proceed against Cornell, Columbia, Duke, Emory, New York University, Johns Hopkins, Princeton, and Vanderbilt. The lawsuits largely accuse the schools of offering overly large menus of expensive and poorly performing investment options and paying excessive administrative fees to the plans’ record keepers. The University of Chicago argued that the worker added to the lawsuit didn’t have standing because he didn’t allege that he paid excessive record-keeping fees. The worker “may have paid” about $37 in record-keeping fees per year, the school said, which wasn’t far from the $35-per-year benchmark the workers previously said was reasonable. The judge disagreed, pointing to language in the workers’ pleadings saying their administrative fees were closer to $166 per year. This factual dispute over the true amount of fees was something that couldn’t be resolved in the early stages of litigation, the judge said. Chief Judge Rubén Castillo of the U.S. District Court for the Northern District of Illinois wrote the decision. Castillo also advised the parties to “exhaust all settlement possibilities” before their next hearing on Jan. 31. So far, none of the cases in this litigation series have settled. The workers are represented by Wexler Wallace LLP, Berger & Montague P.C., and Schneider Wallace Cottrell Konecky Wotkyns LLP. The university is represented by Sidley Austin LLP. The case is Daugherty v. Univ. of Chi. , N.D. Ill., No. 1:17-cv-03736, denying motion to dismiss 1/10/18 .